Tomorrow evening, Thursday, the Alfred James Band will be performing from 6 to 8 pm in the courtyard at Princeton Shopping Center, 301 North Harrison Street in Princeton Township. The Alfred James Band is a cello-driven acoustic rock band from Ardmore, PA. 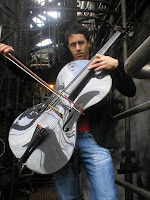 The band was founded in 2001 by Alfred Goodrich (Hun School '94), who is the only cellist in the world playing a black five-string carbon fiber cello — standing up. "Better Days," the first single from AJB's album Lucky If Easy, was featured on the NPR program, All Songs Considered. It received the highest rating of any artist on the program.